Lilly Barrack Sterling Silver & 14k Gorgeous Blue Stone Ring Size 7 1/4"
Ring has a rough cut light blue stone - not sure what it is. 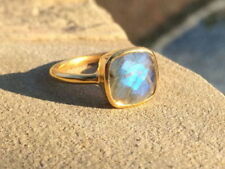 The stone is in a beautiful Oval Setting. Handmade Sterling Silver .925 Bali Long Oval Style Solitaire Ring W Tourmaline. Handmade Solid Sterling Silver .925 Balinese filligree dome style band ring with recthangular shaped labradorite gemstone. Ring Detail: Length On Top: 1.33" or 33 mm Band Width on Bottom: .35" or 8 mm Ring Size: 7 Weight: 12.30 Grams or .434 oz. Centers a large oval 14x10mm milky translucent aqua-blue unknown stone with checkerboard faceted surface, bezel-set with rows of fine rope trim. In very good pre-owned handcrafted condition; silver clean, lightly tarnished, stone clean and glossy. Wire wrapped ring made with labradorite. Handmade with love. Sterling silver. A very unique find. One of a kind 2 Stone Precious Ring. Sterling sliver with citrine and fluorite precious stones, size 7 and in perfect condition. Comes in black jewelry box. This appearance of star dust creates a magical stunning effect. All components are 925 sterling silver. ITEM STAMPED INSIDE BAND UMA. STERLING SILVER WIZARD SETTING WITH A QUARTZ CRYSTAL BALL. THE WIZARD SETTING HOLDING IN IT'S HAND IS A CRYSTAL BALL. 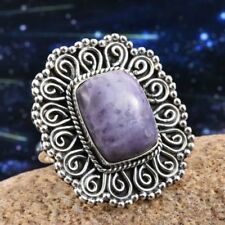 The stone and setting is truly unique with rich color purple. 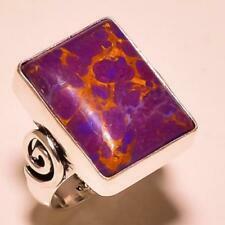 Handmade Sterling Silver .925 Bali Rectangular Mystic Topaz Ring w Mabe Pearl. Rose Cut Bezel Set Green Onyx Sterling Silver Ring. Onyx is a soothing stone, said to help alleviate fears and worries and to help you to feel comfortable within yourself and in your surroundings. It is also said to encourage wise decision-making. Handmade Solid Sterling Silver .925 Balinese oval shaped stone poison ring with moonstone, turquoise, garnet and rainbow moonstone gemstone. Ring Detail: Length On Top: .65" or 16 mm Band Width on Bottom: .14" or 3 mm Ring Size: 6, 6.5, 7, 7.5, 8.5 Weight: 4.94 Grams or .174 oz. Citrine Ring. Custom Cut Stone. Size 7-3/4. Argentium Silver. Hand Made..
6mm precision cut stone showing incredible glitter in any lighting. The stone is set in a tube setting that was turned on a lathe. My goal in creating jewelry has always been very simple. Clean lines and a rich combination of color. Large apprx 2 1/8" long sterling silver modernist ring grey stone. Handmade Sterling Silver .925 Bali Oval Dome Ring w Larimar and Blue Topaz. Handmade solid sterling silver. 925 traditional Balinese swirl style ring with a teardrop genuine larimar gemstone. Silver by Bali. Band Width (bottom side). 12" / 3 mm. Ring Details Length on Top.70" / 17 mm. This ring has a beautiful Lapis Lazuli faceted stone on a sterling silver setting. Ring is set on a wide but tapered band. Band width :3.8 mm(0.15"). Ring Top Side Length: 28.65 mm(1.12"). Ring Size : US 7. 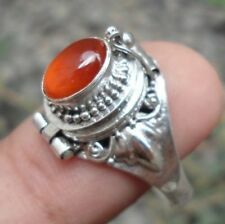 Handmade Sterling Silver .925 Bali Long Oval Ring w Bead and Dot Style. Many Sz. 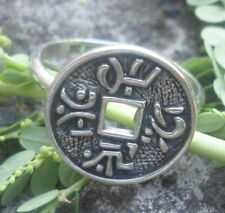 GENUINE SERAPHINITE RING in .925 STERLING SILVER size 7 1/4 FAST FREE SHIPPING ! Handcrafted Adjustable.925 Sterling Silver Ring with Two Oval 9x7 mm Cubic Zirconium Stones. stamped 925. Ring Size-Adjustable from US 5 to US 7. WHITE / BLUE TOPAZ, RHODOLITE RING set in 925 STERLING SILVER FREE SHIPPING !! Look out for the snake! No, it won't bite. It is beautifully hand crafted and can be worn comfortably. When and where you want to wear it, that's up to you on this one! We think you will love it! Handmade Solid sterling silver .925 wrap band promise ring style with multiple white cubic zirconia gemstones. Ring Detail: Band Width on Bottom: .11" or 3 mm Length on Top: .40" or 10 mm Ring Size: 7 Weight: 4.45 Grams or .157 oz. PUMP UP YOUR STYLE WITH THIS BEAUTIFUL RING, STERLING. 925 GENUINE SMOKEY QUARTZ STONE, HAND CRAFTED. And we don't take responsibilities for such condition. I will be more then happy to send more pictures. Ring, sz 8,5K Watermelon Tourmaline Lab stone in gold plate, czs and New!